A Cub is a young boy or girl aged between 8 and 10½ years. Click the uniform for a quick guide to show the position of the most common Cub Scout Badges. The Cub Scout programme still uses the Rudyard Kipling’s Jungle Book stories as a basis, each new Cub finding out about the story of Mowgli’s entry into the Pack. The programme starts on a trail to learning all the Scouting skills needed later in the Scout Troop, giving a taste of the game of Scouting and teaching how to be part of a co-operative team, the Pack. As well as the adventure the fun element of the Jungle Book character’s are used, the Pack leader being Akela, and other assistants Rama, Kaa, Baloo and Bagheera. Cub Scouts wear a common uniform, to create a sense of belonging and encourage a feeling of pride and of being part of a worldwide movement. 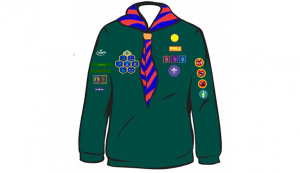 The uniform consists of a green Cub sweatshirt, group neckerchief (scarf) and woggle. 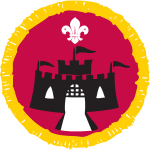 If not awarded at Beavers, the neckerchief and woggle, are presented to the Cub during their investiture along with a set of badges.